Antioxidant Foods: Not Just Fruits & Veggies! Not JUST Fruits & Veggies! Finding excellent antioxidant foods is always the first thing you want to know once you discover how important antioxidants are for your health. 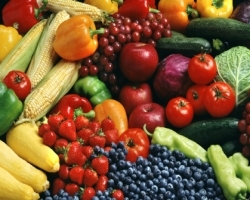 Of course everyone knows that fruits and vegetables are excellent antioxidant foods. And most people also know that the more colorful the food, generally speaking the more antioxidants are in it. Different colored fruits and veggies have different types of antioxidants, so be sure to have very colorful meals so you get the most variety. Remember that different antioxidants help each other work better, so you'll get a better result from a good variety. What most people don't realize though is that there are MANY other antioxidant foods besides fruits & vegetables. Drinks like tea & coffee are excellent sources, but the types of antioxidants vary between different types as well as how they're processed. Red wine, as most know, is loaded with antioxidants. Of course, you need to be conservative with this source so as not to negate the health benefits with too much alcohol. A surprising source of antioxidants are nuts, especially walnuts. The bonus is they're an excellent source of protein and good fat AND they satisfy hunger with a small amount. The perfect snack food! Another surprising antioxidant source are spices, like turmeric & cinnamon. Cinnamon has the added bonus of lowering the glycemic index of the meal, which is excellent for your health & weight control. Even chocolate can be an excellent source of antioxidants! (Who knew all these years as a chocoholic were actually good for me? ;-) You need at least 70% cocoa to deem it healthy though- and of course moderation is important here as well, so as not to cause health problems from the other effects of chocolate (like glycemic spikes and obesity). There are MANY more excellent antioxidant foods and in the near future, I will have a list of them on this page, as well as which antioxidants they are highest in so you can choose what is best for your situation. In the meantime, you can also check out Sensational Berries for information and recipes on berries.